Sky the Blue Fairy is having some bubble trouble. Can Rachel and Kirsty help her out with a clue from the rainbow-coloured crab? this book was amazing i liked the bit where the goblins were ice skatting on ice its was like dancing on ice!!!!!! They will now find sky the blue fairy. this book is magical, just like the others, and i love the color blue! Sky the Blue Fairy is a brilliant book. Will she get better after the goblins get to close to her. Great book. It was my fifth Rainbow magic book ever. It all started when Rachel Walker and her best friend Kirsty Tate were at the beach. They saw a little crab. He was looking for Sky, too. They until they found a rock pool with a bubble with Sky in it. While they were thinking of a way to free Sky from the bubble, the rock pool started freezing and Sky got trapped! Rachel went to look in one of the magic bags Queen Titania had gave them. There was always something to help the girls. This time, Rachel came back with a tiny pebble in her hand. But she gasped when she got to the rock pool. Goblins were skating on the surface of the rock pool! Kirsty was trying to shoo them away. But suddenly the pebble in Rachel’s hand was starting to get really hot. She threw the pebble onto the frozen rock pool. It started melting and the goblins thought it was no fun with water so they ran away. The girls noticed how pale Sky was. The little crab called other little crabs. The crabs put lots of feathers together to make her a little bed. And Rachel and Kirsty took Sky to the-pot-at-the-end-of-the-rainbow. Sky’s sisters- Ruby The Red Fairy; Amber The Orange Fairy; Saffron The Yellow Fairy and Fern The Green Fairy- were there. They chanted a spell that made Sky better. So Rachel and Kirsty found their fifth Rainbow Fairy. Only Izzy and Heather to go! 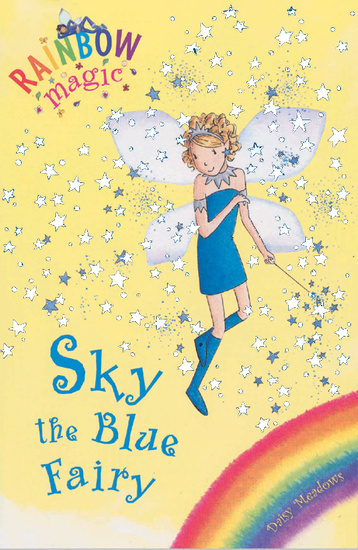 This is a fantastic book about Sky who is one of the Rainbow magic faries. She is having some bubble trouble. Rachel and Kirsty help her out with some clues from the multi coloured crab. This is one of the many books in the Rainbow fairy collection. Theres a fairy to be found in every book, collect them all and you will bring sprakle back to fairy land.